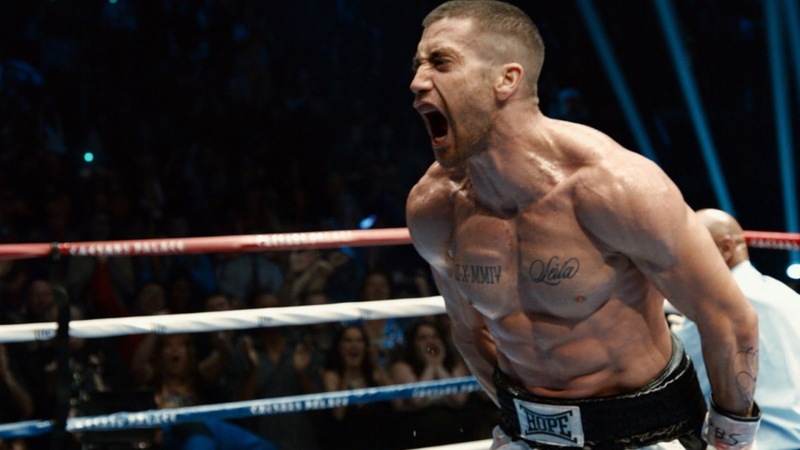 Fight movies are brutal and this new feature written by Kurt Sutter and directed by Antoine Fuqua does not shy away from the realities of what boxing does to the participants. The big concern over head injuries that occur in other sports like football is even more evident in the game of boxing. The big fast money and fame will not help you out when you are “punch drunk” for one too many hits on the noggin. The story also touches on the craziness of how the once were mighty and how quickly they fall. You have to sort that out during the mostly melodramatic story of redemption riding with the balls to the walls performance by Jake Gyllenhaal. Jake plays Billy Hope, a 43-0 boxer who knows how to take a punch. The bloody excessive style in the ring is hard to watch. He's lets the blows come before finding that power to come back and save the day. His wife Maureen (Rachel McAdams) has known him since they were both kids in the foster system from Hell's Kitchen. They have come up in the world living in a mansion now with their daughter Lelia (Oona Laurence). Billy is generous to his posse who surround him since childhood to his success. His manager/agent Jordan (Curtis “50 Cent” Jackson) wants him to sign a new 30 million dollar contract with a cable network. But Maureen begs him to quit to spend some time with their family, not when his brain is too scrambled to enjoy it. At a charity event Billy is egged on by and up and comer Miguel “Magic” Cantu (Miguel Gomez) which turns into a tragedy. This is where the kleenex comes out. Maureen used to be the brains of their partnership. Billy becomes lost and inconsolable turning to drinking and drugs. Soon the custody of his daughter is taken away until he can clean up his act. He turns to Tick Wills (Forest Whitaker) who runs Wills Gym. Their contentious relationship has a slow start until Billy can prove that he really wants to change. The second part of the film's focus is on Billy's transformation and establishing a new relationship with his daughter who is now in a state home. The music does the usual hip-hop soundtrack by Eminem while we fast forward through Wills' training sessions. But not as iconic as the Rocky theme. The final act is all about the fight between Magic and Hope which even though you know in the back of your mind the outcome, it's still exciting to watch. Gyllenhaal who was so brilliant in Nightcrawler and does the same with Billy Hope. He's never looked so lean and lethal with his swollen face and bloody eye. And Whitaker is his usual excellent self. The chemistry between the two makes the movie interesting and have heart. The story itself is somewhat predictable and pulls heavily on the heartstrings. The fight scenes are well executed action-wise although nothing like watching the Friday night fights on TV. The power of Gyllenhaal makes the film worth watching. It's too bad the story was so manipulative.